Jenaya says: My whole family and I were on one of our many day trips to Waterton Lakes National Park. 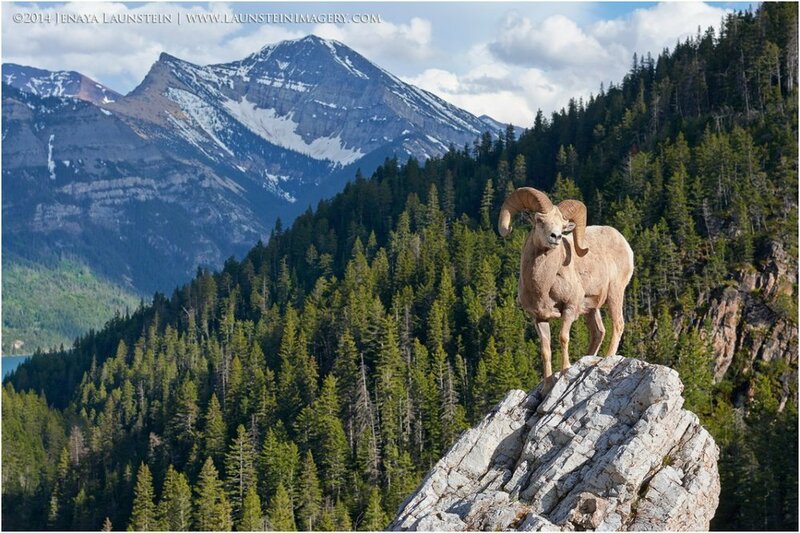 We spotted this cooperative Rocky Mountain Bighorn Sheep ram grazing close by. My dad, brother, and I decided he had to be photographed. We got our big telephoto lenses and started snapping beautiful portraits and close ups of him. After I got what I wanted I went back to the vehicle and switched to the wide angle lens. When I got back my dad asked why I had switched and I said "In case he goes up on that big boulder!" to which he replied sarcastically with something like "Yeah, because he's just going to go and stand on that boulder for no reason." But 5 minutes later he did just that! I couldn't believe it! He climbed the boulder like it was nothing and just stood there surveying the area around him. I let my shutter rip and was so happy that the photos worked out. Afterwards I made sure to rub it in to my dad and brother, haha.